One unique characteristic to my new small room is that it has a very high ceiling. This high ceiling has made me decide to get a loft bed to have more space around and underneath me. Starting with color selections, a brighter color will make the room appear bigger. But don’t let a white room hold you back. 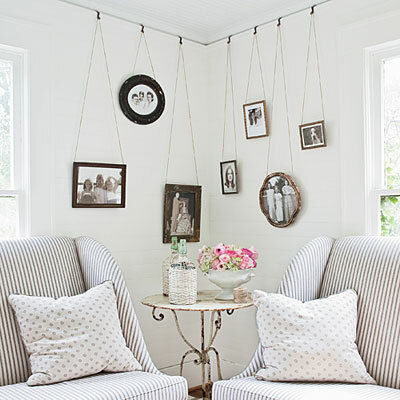 Choose one wall and add thick black and white stripes to lengthen it. Wallpaper can also be an easy way to get creative. A vintage themed will change the whole atmosphere. A collection of shelves can help you save space on the floor by being able to display anything on the walls. They can accessorize your room as well as hold books, frames, movies and necessities. My favorite new thing is using walls and hooks to hang necklaces and bracelets. Why store your jewelry in a box where they can get tangled when you can pin up some hooks and hang your favorites up on the wall? Use a piece of wall paper to frame the section or use cork board to pin them up. And if you want to get a little more creative and have some extra space, why not hang a hammock for guests to enjoy and sit in. Now I’m just a couple more weeks away from finishing up my new bedroom. You can use these ideas and even let us know your creative thoughts on how to save space and style your sleepy place.